I haven't been knitting nearly as much as I would like lately, which is partly because work has been really tough and also because I ran into a snag with one of my projects. My company works 10 hours each day of an 8-day session and that means that some days I end up hiking 7 or 8 miles. As you can imagine, I am usually quite exhausted in the evening. I always try and get at least a bit of knitting time in though! I was moving right along with my twisted flower socks from Knit. Sock. Love. and then disaster struck. I cruised through the first half of the pattern repeat and then a couple rows into the twisted stitch section I miss-crossed a cable somewhere. I honestly don't even know exactly what I did wrong, however I do know that I made fixing it as complicated as possible! When I realized that I had gone wrong somewhere I decided to drop the affected stitches and then pick them back up correctly. I thought this would be easier than tinking back several rows to fix the problem...I was soooooo wrong. Correctly twisting the stitches that I had purposely dropped proved to be nearly impossible and though I finally fixed it, it was incredibly frustrating and took over an hour. I was so focused on correctly crossing the cables that I didn't twist some of the knit stitches. Fortunately it really isn't that noticeable. I just finished the first repeat and I am hoping not to have any mistakes the second time around. And if I do, I now know that tinking back is a much better way to fix it! My wedding shawl has been taking a backseat to the socks for the last few days, but I have every intention of focusing on it for the rest of my time in Eureka, Nevada. Tonight, I am not going to bed until I knit at least one repeat! 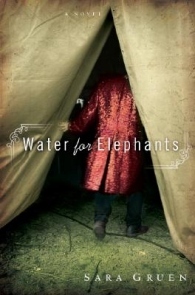 The other thing that has been taking away time from my knitting is the novel Water for Elephants by Sara Gruen. I heard it was a good movie so I bought the ebook for my iPad and promptly devoured it in just a few days. It is a truly excellent book, and I highly recommend it! It takes place partially in the present with the main character Jacob, an old man in a nursing home. The rest of the story consists of flashbacks to when Jacob was a young man working on a circus in the 1930's. It is well written and the story is very engaging with surprising twists, heart breaking loss and, of course, a love story. If your looking for something to read I definitely suggest this novel! Well I am off to work on my shawl...hopefully I reach my goal!